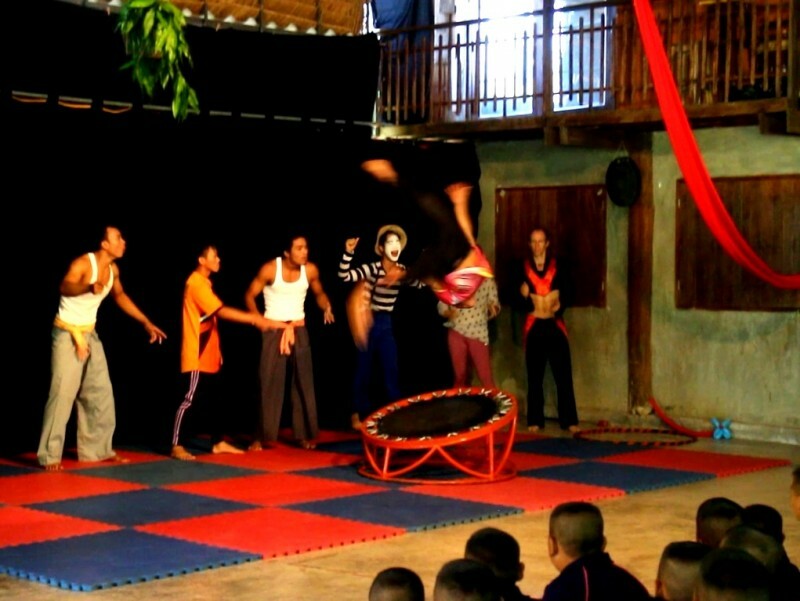 The Circus on the Edge project was supported by the Creative Encounters: Cultural Partnerships initiative between Asia and Europe, promoted by the Asia-Europe Foundation (ASEF) and Arts Network Asia (ANA). It saw the theatrical exchange between circus experts from Thailand and Europe and youths from ethnic minorities in northern Thailand. When youths of displaced ethnic communities in northern Thailand face internal and external social issues, but struggle to find solutions or simply a receptive ear, by what means can others help to build up their confidence and empower them to discover methods of communicating with greater society? From September to November 2015, social theatre organisation Makhampom Foundation facilitated a prospective and progressive solution in the form of a social theatre and circus project titled Circus on the Edge. 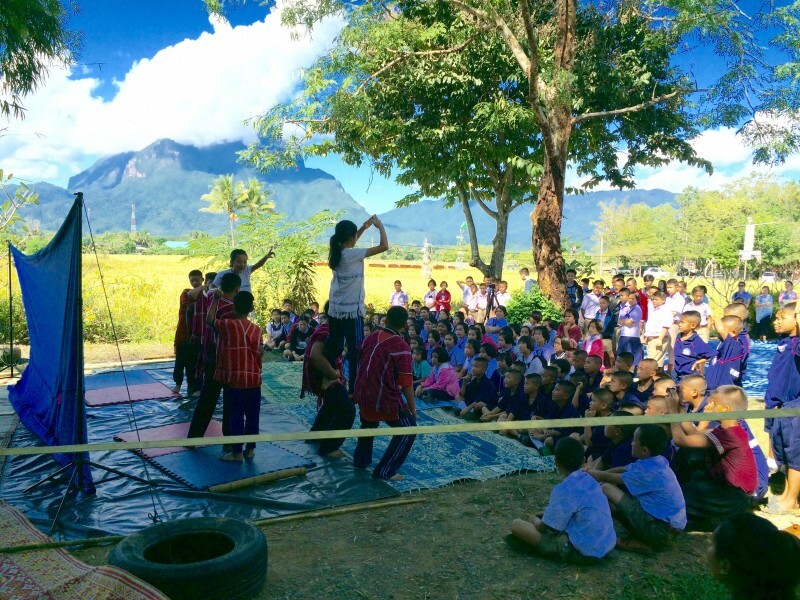 Youth groups from three different ethnic communities in Chiang Mai and Chiang Rai, aged between eight and twenty-six, each underwent a week of circus and theatre workshops. The facilitators were Makhampom’s circus whiz Golf Thanupon Yindee, Andrea Hille - a highly experienced circus director from German Circusschule Die Rotznasen e.V and Jessica Amery - a passionate applied theatre student from England. Thus, a global range of knowledge and skills was showcased, as well as the uplifting experience of different cultures working together in harmony. The workshops culminated in each community coming up with vibrant performances to be showcased. These displayed their talents and informed viewers about the stigmatisation, lack of freedom of movement and ensuing feelings of worthlessness that stateless youths experience. The youth groups firstly embarked upon a small tour of their performance in their own village and the surrounding towns. Our Circus on the Edge team stepped back and assumed a supporting role, allowing the youths to build long-term teamwork and management skills as they were left to prepare their performances themselves. Some youngsters encouragingly (albeit cheekily) told us that we could sit back, relax and simply enjoy the show. This was all due to them feeling that they were able to function independently as a theatre company. Dara’Ang Youth Group, Pang Daeng Nok, Chiang Dao - The children are from one of the poorest ethnic minorities in Thailand and endure frequent discrimination. However, they expressed a greater feeling of self-worth as a result of seeing the audiences’ delight and appreciation of their skills. Karen Youth Group, Pateung Ngam village, Chiang Dao- The participants’ show raised awareness and stimulated discussion about the threat and potential extreme impacts of an authorities’ plan to build a water tunnel and reservoir directly on the territory of their beloved village, and the subsequent effect on the environment. 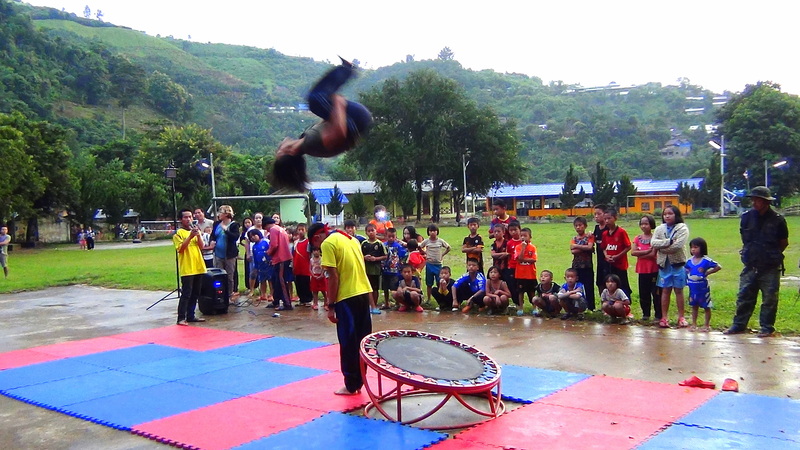 Hmong Youth Group, Phu Chi Fa village, Chiang Rai- The youths performed a spectacularly acrobatic show that, they felt, encouraged other youngsters in the village to join their performing troupe and avoid the pressures of turning to drug use. 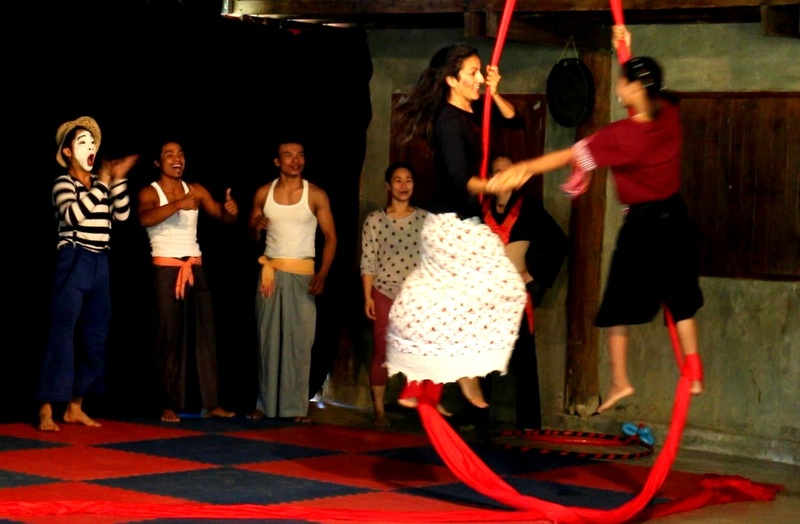 The youth groups then came together for a two-day advanced circus and theatre workshop exchange at the Makhampom Art Space in Chiang Dao district. The workshops were led by international circus experts, namely Louis Kris Sanguanpiyapand - a captivating mime-artist and creator of Blind Theatre from Thailand; Jiab Manassanan - a trapeze-flying figure of strength, the dazzling fire performer Gordon Ruff from Germany; Stefania Ermione - a comedic aerial silk artist from the Italian Scuola Di Circo; and Channa Ton and Chanda Chhoun - circus extraordinaires from Cambodia’s Phare Ponleu Selpak. The exchange was a rare opportunity to provide youths with specialist advanced training to strengthen their performance tool-kits. With more skills, the youths would be better equipped, both physically and mentally, to continue using theatre to create performances that could spark movements of social change. The youths seized the opportunity and thrived upon it, as they eagerly continued practising their newfound skills late into the night. All youth involved currently work in their communities on either farmland, in construction or in terms of caring for their households. However, for many of the youths, circus and theatre is a potential source of additional income and also a passionate ambition. Following the exchange, some participants commented on how a performing career previously felt unattainable because they were an ethnic minority. Having learnt about Channa and Chanda’s journey from overcoming their disadvantaged background to becoming full-time circus performers, many youths said they were now inspired and had a strong belief in their ability to achieve the same results. Another pleasant outcome of the exchange was the bonds developed between artists and participants, and between the youths themselves. The exchange allowed for the creation of a safe space with no barriers of age, culture and perceived social status. One night, everyone came together to celebrate and share the diverse food, music and games of all cultures present. The appreciation, rather than discrimination, shown for each other was uplifting. The Karen youth, who are of a particularly shy nature, reflected how they felt more confident with increased social interaction, and therefore more cheerful as they were revelling in their new friendships. In turn, having more friends diminished their feelings of being invisible and remaining rooted in their displaced backgrounds. The ethnic groups shared the same stage as the circus experts. This showed the public that individuals’ backgrounds did not have to be barriers to the showcase of talent; and the performers recognised this for themselves as well. The audience were impressed at the youths’ skills, gasping in awe as they flipped through the air, swung on the trapeze and danced on aerial silk. This reaction had a positive impact on the youths as it raised their delicate self-esteem, given that they were used to being viewed as hailing from a lower social status. Visitors to the festival described it as, “magnificent”, with “a special and beautiful atmosphere”, “audiences sunk deep into the youths’ performances” and “an appreciation and celebration of each communities’ own specialties and styles”. In addition, it is equally important that our team, the guest circus artists and communities are keen to work collaboratively again - to strengthen the friendships that blossomed and the true vision of equality that was displayed. Hello, I am Jessica Amery and I am in my final degree year of the Drama, Applied Theatre and Education course at The Royal Central School of Speech and Drama, London, England. I co-facilitated the Circus on the Edge project, worked in the role of media and provided smiling support and a big heart to the team and the participants. The Asian-European nature of this project is significant and I look forward to transferring the social-theatre skills I have developed back to displaced communities in England (and hopefully beyond).